Obese children have a 26 percent higher chance of allergies, especially to food, than their slender counterparts. The food allergy rate was 59 percent higher for this risk group. Researchers aren’t sure yet whether the heaviness is the cause of allergies. But further study is clearly needed, as the asthma and allergy rates for kids is higher than in the past. While the results from this study are interesting, they do not prove that obesity causes allergies. More research is needed to further investigate this potential link. So what defines “obese”? And what can we do for these kiddos?Obese kids were in the 95th percentile for their Body Mass Index (BMI) or higher. In the U.S., 16 percent of kids aged 2-19 fall into this category. 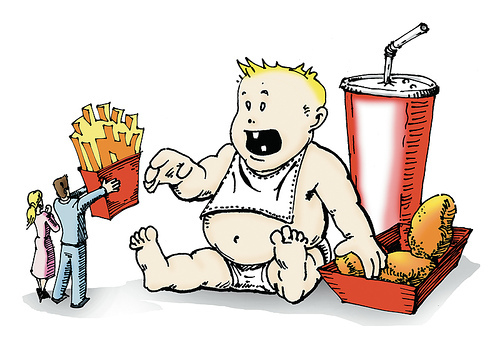 A recent study also shows that a full 20 percent of American 4-year-olds are obese. That’s obese, folks, not just overweight. Indeed a problem. So what might cause these food allergies? Personally, I’d like researchers to look into the diets of these children. From my experience, kids who are introduced a broad range of foods slowly are less likely to have food allergies. Let’s also remember that children who are exposed to the outdoors, especially on farms, can have a lower chance of allergies and asthma. And even those slim or chunky kids who do have food allergies may be able to combat them through small doses. Just like homeopathy. In this study, researchers looked at a number of factors, including total antibody levels to indoor, outdoor and food allergens, body weight, and responses to a questionnaire about diagnoses of hay fever, eczema, and allergies. Image: Joe_13 on Flickr under a Creative Commons License. I would also want research into the prenatal effects of the mom’s diet & environment while she’s pregnant. It’s important to care about everything we put into our children. I also agree that pregnancy eating has a tremendous impact on a child’s diet and eating preferences. My son has food allergies and he is in the 25th percentile for weight. He has always been a “slim” kid and his peanut allergy is very severe. I noticed you said “From my experience, kids who are introduced a broad range of foods slowly are less likely to have food allergies.” What experience do you have with food allergies? I think it is dangerous and untrue for you to point your finger at parents and blame them for causing their child’s food allergy. A food allergy happens when the body accidently churns out IgE antibodies on a harmless food. Would you blame the mother of a child with Type 1 Diabetes for their lack of insulin? Parents do not cause food allergies. If you read the conclusions of the SURVEY DATA you would have seen and I quote “Obesity MIGHT be a contributor …” There is no conclusive data at this time. Also, food allergies CANNOT be cured with homeopathy. Trying to cure food allergies without the guidance and medical help of a medical doctor is dangerous and could be deadly. Medical studies out of Duke and Mt. Sinai are performed in hospital settings under the close supervision of medical staff that can and do stop anaphylaxis when it occurs during these TRIALS. This type of sublingual immunotherapy is not FDA approved and should not be tried at home. I think your article is dangerous to the health and well being of children with food allergies. I also believe that your article falsely makes the data of the study sound as though it is a fact-when it is truly only a possibility. This article goes to show that it is easier to blame someone then to CHECK THE FACTS. Sad! My experience with food allergies is my own and that of my family’s. Not to mention the numerous studies I read. I follow children’s health news avidly. Personally, I have a handful of moderate food allergies to very common foods (corn, coffee, soy) and a very severe food allergy (pistachios=anaphylaxis). I didn’t blame parents for their children’s food allergies. I simply suggested we look into their diets more closely. Because the first foods we give our children can help us notice early if they have food allergies. I also didn’t say that ONLY fat kids have food allergies, or that obesity causes allergies. I wrote, “Researchers aren’t sure yet whether the heaviness is the cause of allergies.” And more research is needed. Nowhere in this blog do I suggest correlation IS causation. I apologize for not going into detail about the studies that have shown that food allergies can be lessened or cured by homeopathy-like treatment, but I linked to those blogs because those authors already delved into those matters. I also did not and don’t advocate that people try these methods on their own, especially if the food allergy is severe. These studies were done under the care of physicians and had pretty good outcomes. These studies included allergens like eggs and peanuts. Often severe, yes, but can be treated enough that children may even eat foods with those ingredients. Incidentally, I consume all but my own severe food allergy daily. I haven’t tried the “small dose” treatment with pistachios, mostly because it doesn’t matter too much to me. In your article you stated and I quote”…kids who are introduced a broad range of foods slowly are less likely to have food allergies.” You did not suggest in any way that foods given slowly help parents to notice early food allergies as you claim in your comment. Please re-read my comment as I never accused you of saying ONLY over weight children have food allergies. I stated, ” I also believe that your article falsely makes the data of the study sound as though it is a fact-when it is truly only a possibility.” I would also never say “fat kids” as you did. I think it’s rude. I don’t understand why in your comment you are stating that you consume all but one of the foods you are allergic to. Are you condoning your behavior of going against food allergy specialists, such as Hugh Sampson, that advocate strict avoidance or are you trying to prove you are tougher then the children who would die if they eat the foods they are allergic to. I stand by my comment; I believe your article ill researched and dangerous to readers. You took that first quote out of context. I started the sentence with the modifier of “From my experience…” That’s why I’d like researchers to look into it; because that is my experience and the professionals would be better equipped to study it. Other commenters here mentioned that they’d like researchers to look into the mothers’ prenatal diets. I think we were simply having a discussion of various contributing factors we’d be interested to see studied. As far as calling obese children “fat”: they are. I would never call some little kid “fat” or make fun of them, but dressing up the problem with “overweight” and “obese” all the time is not only redundant, it masks the horrible problem with politically correct phrases. In the discussion about childhood obesity, then, I think it’s alright to use the word “fat”. Interestingly, U.S. News & World Reports use it in their own blog on the matter. As far as my practice of consuming foods I’m allergic to: the homeopathy-type practice works for me. I wasn’t discussing food allergy specialists; I was discussing my own personal practices. You asked for my experience, and that is my experience. It’s clear this is a very sensitive topic for you, and I’m sorry to have offended you. I’m also interested in seeing a comparative study of those two groups (esp. if vaccinations are taken into consideration, too). We don’t *exactly* live on a farm, but we live in the country, have a dozen chickens, and have a pasture full of cows right behind our house. (We don’t come into contact with the cows, which is why–though it sounds pretty much like living on a farm–I wouldn’t consider it the same. Though we do use their “leavings” in our compost piles!) Much more the farm life than my ‘burbia upbringing. My older son (3.5 years) was minimally vaccinated, and we stopped about 2 years ago. My younger son (1 year old) has not been vaccinated. As far as immune system strength, my 13yo stepdaughter certainly brings home some bugs from school. But overall, they’re healthy guys. What I’m really interested in seeing is whether they end up with fewer seasonal allergies than their sneezy mama due to their exposure with to more allergens.